Subaru may want to show its rear-wheel-drive capabilities with the newBRZ, but, fortunately, this doesn’t mean that, from now on you’ll have to turn to tuners for performance AWD Scoobys. To confirm this, Subaru let it slip during the LA Auto Show that the next generation WRX and STI will not only be offered as stand-alone models, but will also send the power to all four wheels using a turbocharged version of the company’s new 2.0-liter FB flat four, as Car and Driver writes. The company said that both vehicle should loose weight thanks to the new platform and that the new powerplant will deliver 300 hp under the bonnet of the STI. Six months into our year with a long-term 2011 Subaru Impreza WRX STI Limited sedan, we’ve discovered that the car still draws attention. During the second quarter, we were challenged to a street race by a teenager in a modified Nissan 350Z (we declined), were pulled over by a police officer who claimed we were speeding (we weren’t, and didn’t get a ticket) and were cornered in a parking lot by a previous-generation WRX owner who talked our ears off for 15 minutes. Not to mention the countless waves from other Subaru drivers on the road. We haven’t decided whether we like all of the attention (particularly from the boys in blue), but we do like the STI’s performance chops. “The car positively loves to be driven hard and responds with a level of agility and reaction that makes it a firecracker waiting to explode down the road,” one editor said. And that was when our STI was still wearing a set of Michelin winter tires. After we reinstalled the Dunlop SP Sport 600 summer rubber, praise for its handling prowess magnified. “I love the car’s ability to carve up the tarmac as if someone dotted the tires with superglue,” noted one staffer, who also pointed out that the tread switch also knocked out a bunch of highway tire noise. While some editors initially were disappointed in Subaru for not finding a little extra power in the 2.5-liter turbocharged boxer four-cylinder to go along with the suspension upgrades for 2011, nobody has complained about 305 hp being inadequate. In fact, everyone found power to be potent, especially when SI-Drive is switched to “sport sharp” for maximum power and throttle response. The second quarter also saw the STI gain its long-distance stripes on a few occasions, including carrying our senior editor for motorsports to Indianapolis for the Indy 500. While the STI is louder inside than most cars, it’s not unbearable, and having the satellite radio cranked for entertainment helps. The leather sport bucket seats are not only supportive for lateral maneuvers but proved comfortable for extended stints behind the wheel. The navigation system is also fairly intuitive to use and got us to all of our destinations without any hitches. The stiffened suspension isn’t overly jarring, either. “I think Subaru has hit a decent middle ground in providing both manageable ride comfort and respectable stiffness through corners,” one cross-state traveler commented. Mechanically, the STI has been a rock, with the only trip to our local service department being for a scheduled service which included an oil change and general inspection. However, we did lose three days to a body-shop visit to replace our front bumper, which suffered a cracked lip while driving through heavy snow accumulation and ice courtesy of a late-winter storm. 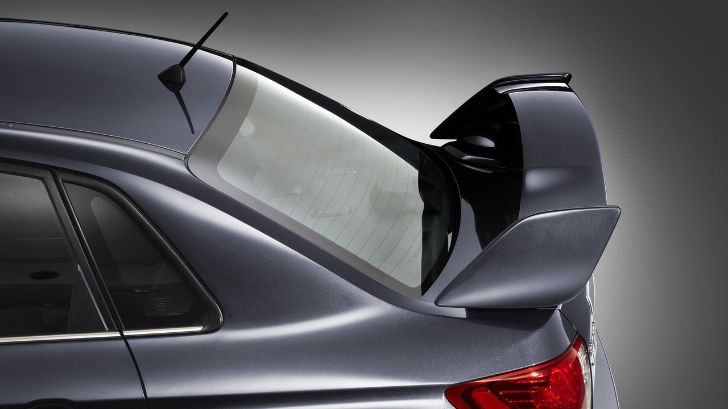 Not surprisingly, the larger rear spoiler and near-$40,000 as-tested price of our STI still raise some eyebrows, but complaints have tapered off drastically compared with during the first quarter. Maybe it’s because we finally “get it” and have been indoctrinated into the cult of Subaru enthusiasts. Now, when we receive waves from drivers of other Imprezas on the road, we find ourselves waving back. Subaru Rally Team USA drivers David Higgins and Dave Mirra star in the pilot of Battle Cross, a new highly-anticipated television show scheduled on SPEED TV on November 17 at 10pm Eastern, 7pm Pacific.